After a period of testing, today see's the live release of Custom Stock Checkers on Stock Informer. This exciting new feature allows users to create their own personal stock checker which tracks the webpages that they wish to track. Users just need to instruct Stock Informer which retailer product web pages to track from which we will then automatically monitor these for stock. Progress can be monitored via a personal webpage (see screenshot) and when stock is subsequently found, audible alerts and optional emails will alert users. Here at Stock Informer we will set up our 'standard' public stock checkers for really popular high demand items where there is a chronic shortage of stock. However there are always other items for which people can't find stock which is where Custom Stock Checkers come in. 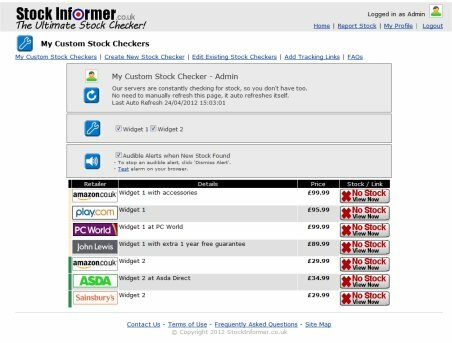 The service is free to use for registered users of Stock Informer who can create as many stock checkers as they like and track as many products as they like.